At 4-1/4 inches total length, the Mountain White-eye is just a bit longer than its lowland cousin, albeit it is as active and tough to capture. It's a resident bird at higher elevation in most Philippine islands. I was birding at Mt. Data in 2006, searching for the Mountain Shrike, when a noisy flock of these tiny creatures descended on some flowering shrubs to feed. 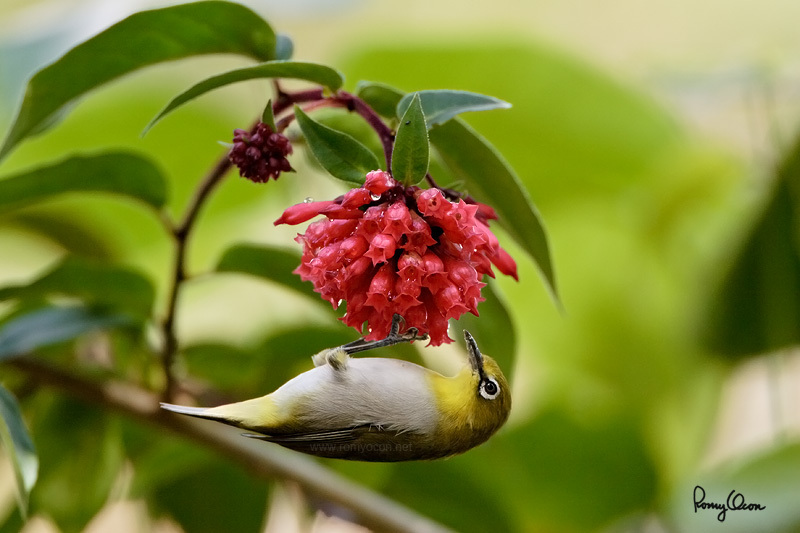 One bird suddenly perched upside down on a photogenic flower and started to sip nectar. I had to shoot from the hip, so to speak, to catch the action. My manually set exposure was off by about a stop under, but one of the frames in many short bursts got the subject with a decent pose, catchlight and strong eye contact. Careful post processing work resulted into an image that to me was worth the twelve-hour drive from Metro Manila to the Cordilleras. Habitat - Noisy and active in all forest types above 1000 m.
Shooting info - Elev. 2155 m ASL, Mt. Data, Bauko, Mountain Province, Philippines, November 6, 2006, Canon 20D + EF 500 f/4 IS + Canon 1.4x TC II, 700 mm, f/5.6, ISO 400, 1/320 sec, 475B/3421support, manual exposure in available light, uncropped full frame.